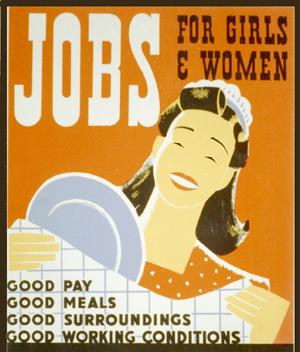 This site was developed by the Harvard University Library’s Open Collection Program, and focuses on women's roles in the U.S. economy from 1800-1930. The exhibit features 500,000 "digitized pages," including manuscripts, pamphlets and photographs drawn from a number of archives and libraries. This site was organized by the Schlesinger Library of Radcliffe College at Harvard University and the National Heritage Museum in Lexington, Massachusetts to accompany an exhibition and a book. It presents a broad view of about 40 women from the 16th century to today who owned and operated successful businesses, drawing material from various institutions. Selection criteria of the OCP: topic must relate to Harvard University, utilize a range of material from a number of Harvard libraries in different capacities, not duplicate the efforts of other institutions, and importantly, the topic must be one that Harvard faculty will advise on and be interested in teaching. Selection criteria for Women Working: wide range of academically significant materials that focus on women’s experience of working (not just the technical aspects of their work) and cover the period 1800-1830. Focus on materials that appeal to younger students. This site was designed to accompany a traveling exhibit that took place in 2003-2005. Bring together highlights of the AAS’s collections to illustrate the role of American women in work from the American Revolution through the Industrial Revolution. Teacher resources: mini exhibitions on topics such as Soap and Settlements: "Making a Cleaner Society"//, and "One Kitchen or Fifty? : Conveniences, Cooperation, Consumption. These pages include brief discussions of the topic, photographs and other digital documents, bibliographies, and learning standards. “Stories,” or short biographies on about 40 American women from the colonial period to today who contributed to business history. The site features women like Mary Katherine Goddard (1738-1816), who owned and operated the printing press that printed the Declaration of Independence, as well as Meg Whitman, the president of E-bay. These blurbs includes thumbnail-sized images. Images and transcriptions of “mentor” letters from figures such as Susan B. Anthony or Amelia Earhart. These letters are responses to young women who asked advice of these women. Games about women in business history and contemporary business plans (these games are non-functional). 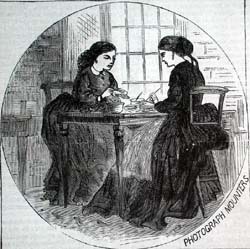 Illustrations, etchings, photographs and a few printed documents that accompany brief overviews on various professions such as domestic work, teaching and factory work. Designed for students and teachers at a college or high school level. Site could be used to support research papers, classroom teaching, etc. It does not guide the user through the collection, so it may not be the best place for a high school student to start their research. It is perhaps better suited for those who have some knowledge of the field. For example, it is unlikely that a high school student will use the 1923 Industrial Welfare Commission report on Minimum wage for women in the laundry industry in the state of California. This kind of document would be more appropriate for a researcher or graduate student. The site is included in a number of library catalogs, including Bobcat and Worldcat, highlighting its orientation toward researchers and college students. Created by the Schlesinger Library of Radcliffe Institute at Harvard University and the National Heritage Museum. Funded by Ford Motor Company and AT&T. Designed for high school students and teachers, and perhaps undergraduates. Could not necessarily be cited as a resource itself, but gives good resources. Ideal for National History Day. Designed for high school students and useful for National History Day. This site is best suited to younger high school students or as an initial introduction to the topic. This site is a digital archive, and therefore treats its documents in a traditional (if that can even be said in this context) archival fashion. Items are organized by format and subject, given very detailed description in their metadata, and are not edited by the creators. Unlike a traditional archive however, this site thoroughly considers the display of documents and images. The quality of digitization is superb, and the user is given control over how he or she views an item. Images can be viewed through Harvard’s Image Delivery service, using the “JPEG 2000 Interactive Viewer.” Users can zoom, pan, rotate, print and save images. One can also access the copyright restrictions on each image. OCR was used in transcribing printed text for this project, and there definitely are some errors, although they are not overly distracting. The user has the ability to toggle between the image of the document and the transcription. This site is not overly concerned with the display of documents, as it is meant to accompany the exhibit. Users are shown thumbnails of a few images related to each woman, and they are not given the ability to manipulate them. Some metadata is attached to these images, including a short description and the name of the repository from which it originated. One can view enlarged images of a few letters in the "mentorship" section. This site does include a small amount of transcriptions of letters in the “mentors” section that appear to be error free and are accompanied by images of each letter. There are also transcripts of short audio clips of four women, including Martha Stewart, who talk about their “influences.” It is not clear how these transcriptions were performed, but presumably simple keyboarding was used. Documents are treated similarly in this project, however, some of the more detailed images can be enlarged by clicking on them. No metadata beyond a description accompanies the images. This exhibit reads much like a textbook with illustrations. This site also does not provide transcriptions, even for images of documents that are too small to read the text. Some of the images can be enlarged, but most cannot. The images are simply meant to illustrate the text. Documents can be searched by title, name/creator, subject, form/genre and document type, or a combination of these categories. Results can be sorted by date, title, name/creator, and type. Searches can be limited to full text of books, but it is noted that handwritten transcripts have not been translated, and are therefore unsearchable. For example, searching the world settlement in full text returns 9491 items, and each item listing includes a bit of text (like a Google search result) displaying the location of the search term in the text. Also displayed is a relevancy percentage. It is not clear whether or not words have been regularized, but searches for misspelled words returned no results. Searches can also be conducted on many of the documents within the PDS document window. From there, one can search by keyword and sort by relevance, alphabetically, or by date. There is a helpful hit on truncation in this search box as well. One drawback is the lack of transcription of written text, which allows for no searchablity with exception of the title, author, date, LC subject heading, and category tags. According to the FAQs, the project is finished digitizing, so transcribing written text does not appear to be in the works. There is no searching function on this site. One may view the historical stories in either the ‘story quilt” or an alphabetical index. The “your stories” archive does not seem to be functioning. There is no searching function on this site. The material is organized by type of work. There is an image index organized by the same work categories. All three of these sites more or less seek to illuminate the experience of women working during and around the 19th century, but they execute this goal in very different ways. Women Working clearly employs an archival approach to this project. This site presents a large amount of well documented material in varied formats with very little guidance (other than the teacher resources) on how to interpret the things you find. Yet after spending a little time on this site one does begin to get a sense of the experience of women working in America. Looking at the view from the porch of a 1903 settlement house on Telegraph hill in San Fransisco, one feels transported to that experience. I'm not sure if feeling transported is an effective means of learning the history of women working in America, or if that was even a goal for this project, but it does give the user something more than he or she can take from a textbook. However, I think Women Working seeks to do more than just "tell the story" of women working. It also, and perhaps more importantly, attempts to document their history, not by writing or analyzing it, but by literally showing people the artifacts that defined their experience. I applaud the quality of the images on this site. The page and image “delivery services” Harvard uses are easy to use yet allow for a very high level of manipulation. One drawback is that the Image Delivery Service lacks an obvious method of saving, printing and emailing images- one has to go into the help section to lean how to do these things. Overall, this site succeeds in its goals of providing access to these materials for the benefit of teachers and students. Rating: 5 out of 5. Enterprising Women, on the other hand, overtly tells the stories of the women it presents.The written material is clearly the purpose of this site, which is not necessarily a bad thing. The writing is good and informative and is accompanied by a short but useful bibliography of scholarly material about the women. The teacher resources also feature reputable scholarly sources. These narrative and bibliographic components come from trustworthy scholarly institutions: the Schlesinger Library, Radcliffe College, and The National Heritage Museum. The site also clearly credits those involved with the project- a transparency that reflects well on the creators. This site was designed to accompany an exhibit and a book, and I think it does very well in that context. It is less successful as an isolated site because it fails to utilize documents in a compelling way, the images are far too small to be useful beyond illustration, and many of the features of the site do not work. Yet it nevertheless provides valuable and useful resources for teachers and students. Rating: 3 out of 5. I initially gave this site a 2 out of 5 because I felt that it failed to really highlight the digitized material. While this is still true, I think it is important to consider the audience of the site when determine its worth. This site is clearly made for a younger audience, and it does quite well in terms of providing an accessible introduction to the history of women and work in America during the late 18th and early 19th centuries. The AAS obviously has fewer funding options than Harvard, and lacks the corporate sponsorship of Enterprising Women. However, I think they could have revised the site in an effort to provide access to their valuable material in a more dynamic way. They have have other online exhibitions that do a better job of displaying their archival material. Rating: 3 out of 5.